An eye-opening article by Dr. Karlo Mauro showing you that getting your bowels moving doesn’t have to be as boring as eating bran cereal & bran muffins every morning! Probably not new advice for you. If you’re lucky, your doctor might even give you a list of high fiber foods. This list may motivate you until you get home. And you stick it on the fridge. And each morning you wake up and find yourself before a list of foods. You have 30 minutes to get in the car and get to work. Now, the list of high fiber fruits, vegetables and grains suddenly seems like a NASA printout. If you’re a great cook, the high fiber food list is probably child’s play. But if the kitchen intimidates you — like many of us — than you need more than your high fiber food list. You need a customized recipe book. A recipe book that ONLY includes the healing foods specific for your intestinal health. Five years ago, I developed a booklet called 27 Constipation Relief Strategies for Women which has helped thousands of women across the globe get their bowels more regular. The tips and strategies are so simple yet extremely effective. And most of the 27 strategies don’t even involve any foods at all. Since then, I’ve been asked by my readers for simple yet tasty recipes that’ll help them become more regular. You’ll be happy to know that Dr. Mauro’s Constipation Relief Recipes is finally available. My new Constipation Relief RECIPES are here to make your gut healthier while making your life simpler. I’ll show you exactly what you need to eat to have better bowel health and stay that way… and I’m going to show you how to pull it off too. In my clinic, I use a Food Pharmacy computer program (which cost me over $1,000) in which I check off various vitamins, minerals and nutrients that support intestinal health. This sophisticated program cross references all known food related information regarding bowel health. Foods that inhibit your body’s ability to balance and heal its gastro-intestinal tract (that need to be avoided 90% of the time). Foods that are neutral (neither harm nor heal). And foods that have a positive healing effect on the gastro-intestinal tract (your own personal super-foods). No diet book can compete. This is like getting your own customized diet book — simplified down to a piece of paper. You’ll know exactly what foods are like MEDICINE for your intestinal tract (hence Food PHARMACY versus DRUG pharmacy). You’ll like it a lot. But you’ll be even more thrilled with what I did with that list of foods. I took the Food Pharmacy food list and from it, created over 100 anti-constipating, bowel-regulating recipes. I’ve essentially created your very own recipe book not only suited to my naturopathic food prescriptions for constipation but also to your level of SKILL in the kitchen. If the highlight of your cooking career has been mac & cheese then you can follow the easier recipes which are quite simple. If someone with more experience cooks for you, or you’re pretty skilled in the kitchen, then I have some more advanced recipes for you. Your gastrointestinal situation is unique and you can’t just rely on any recipe book off the shelf. They may have great stuff, but you need to play a bit of menu roulette in order to figure out what works for you. And maybe you figure out a few good meals, but then end up eating them too often. I see this all the time when I look at my constipated patients’ weekly diet diaries. Same thing for breakfast and lunch, every day. For example, most constipated people eat oatmeal or bran cereal every day because it helps their bowels move. Be aware: if you eat oatmeal or bran cereal every morning for breakfast you’re going to develop an allergy and/or intolerance to it. It may take months to develop… but eventually your body’s not going to be happy with you. It could be life-changing to you. If you haven’t been following a diet suited to your bowel health… and haven’t been getting any better, then this could be exactly what you need to regulate your bowels, boost your energy, shed some pounds and relieve your bloating & gas. I wish I could sell healthy eating in a bottle. Pop a pill and get everything you need. Sadly, nature didn’t make us that way. But if you have SIMPLE recipes to follow, which include foods that you ENJOY and don’t upset your stomach… well, eating wouldn’t really be all that bad, would it? Reviewed all the foods from my Food Pharmacy program food list (which is included in my recipe guide). Refined my stockpile of anti-constipation recipes to suite EXACTLY what you should be eating to improve your bowels. I’ve created for you over 100 easy to prepare anti-constipating recipes with exact cooking instructions. I’ve organized them into categories… Breakfast (14 recipes), Smoothies (43 recipies), Juicing (14 recipes), Soups (14 recipes), Salads & Dressings (17 recipes), Dips (10 recipes), Muffins/Cookies (11 recipes). The most incredible thing out of all of this is how much I’m charging to provide you with all these bowel regulating recipes. If I were to sit down with you in my office, one-on-one and go through all 100 recipes, it would cost you well over $800 in visit fees. Fortunately, you won’t have to pay anywhere close to $800. In fact, you won’t even pay $50. The regular price for Dr. Mauro’s Constipation Relief Recipes is only $27. I haven’t met a person yet who didn’t benefit from the recipes in my guide. But don’t worry, you’ll still be protected by a money back guarantee. Go ahead and order my recipes today. Then, if for some strange reason you decide it’s not for you, just let me know and I’ll give you a complete refund. I’m selling Dr. Mauro’s Constipation Relief Recipes and processing the orders through Clickbank (the largest payment processing company for digital products in the world), which means I play by their rules. Their rules state that I have to offer you a 60-day, money back guarantee. And I’m fine with that. I stand behind my recipes completely and know you’ll be completely thrilled with the recipes and, more importantly, the results. However, for your peace of mind, know that a refund is available anytime for the next 60 days by simply emailing me or Clickbank (refunds@clickbank.com) if you are dissatisfied for any reason. Eating meals rich in fiber is simple… if you know exactly what to eat. Dr. Mauro’s Constipation Relief Recipes gives you what you need to eat and how to make it. You’re getting over 100 gut healing recipes to help your gastrointestinal tract. In fact, there’s no simpler and more affordable way I know for you to help become more regular. Ordering is easy. Simply click the link below to get your copy now. If you have any questions or difficulties ordering Dr. Mauro’s Constipation Relief Recipes please email care@constipationreliefrecipes.com. We are glad to help. Copyright © Dr. Karlo Mauro N.D. 2019. All rights reserved. These statements and products have not been evaluated by the FDA or Health Canada. These statements and products are not intended to diagnose, treat, cure or prevent any disease. 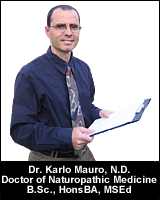 Dr. Karlo Mauro, ND is not responsible in any manner whatsoever for any damage or injury resulting from the use or practice of the information presented here. The information described and shown here are for informational purposes and are offered to assist people in their individual education and research. Due to varying conditions from person to person some of the activities described may not be appropriate for some people. The viewer of this site should consult with his or her physician or chosen health care provider if you are considering use or practice of the information presented here. The information given here is in no way intended as a substitute for proper medical care.